Organizing a tour bus ride near Chicago has a few challenges that come with the territory, especially if a large group is in question (and that’s almost always the case since luxury bus rental Chicago close to you is needed). This team understands that people usually want to avoid or at least minimize the stress that comes with touring. Naturally, that’s why you choose to go with the best transportation company in Illinois, so you could enjoy the benefits of well-arranged bus travels without hassles along the way. There’s no tour challenge Swift fleet and Swift people can’t handle! Where Can I Find the Nearest Tour Bus Rental Company in Chicago? The address is 1100 Jorie Boulevard Oak Brook, IL, United States, if you want to come down knockin’ on our doors. Still, it’s probably simpler to reach us directly through this contact us page, isn’t it? 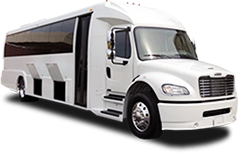 Since the whole idea is that convenient bus charter Chicago rental nearby comes to you and picks your group up whenever and wherever it suits you, not the other way around. With a few clicks, you could have a direct line of communication with Swift’s dedicated drivers and support staff. They are eager to hear about your plans and help them see the light of day (or darkness of night, if an overnight trip is on your itinerary). Give us the coordinates and you’ll find your way from the airport to any wedding venue near and far from Windy City, from your business meeting to Notre Dame games or anywhere else needed in no time! How Much Does Chicago Coach Bus Service near Me Cost? If you are looking to book a Tour Bus service near my location with Swift Charters, you can do so by using a simple booking form found on the homepage that allows you to calculate a route and a price, whether you require a round trip or an hourly-based service. As an alternative to using the website form or in case you’ve got any additional questions, give us a call at +1 312 762 5333 and skillful support agents will be there to answer them and assist you with your booking. Which Benefits Come with Booking a Chicago Charter Bus My Area? So, the ultimate delight while on city breaks, art tours, cultural sightseeing, gastronomic voyages, city breaks, and other similar endeavors, ain’t gonna cut it? OK, let’s kick things up a notch! Did you know that Swfit support doesn’t end as soon as you book a coach ride near the airport (or close to any other location for that matter)? This firm’s solid belief is that you should get the service you deserve for as long as you are riding with us which is exactly why our drivers will be there for you throughout the whole tour experience. Assisting you with any inquiry you may have, as well as offering valuable advice on how to organize a perfect bus tour, is a given when you choose us to handle the logistics of your tour. The only thing left for you to do is relax and enjoy the ride, your desired destination is right around the corner.